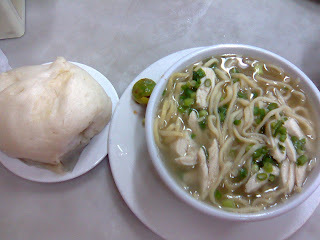 Ma Mon Luk at Quiapo is the original branch. And now I think they're down to two branches (the other one is in QC). Ma Mon Luk was a poor Chinese who went to the Philippines to earn money and save so he can marry the woman he loves. He made a twist to the original bami being sold in Quiapo and practically reinvented Chinese cooking to suit Filipino palates. And thus, Ma Mon Luk has become an institution. Ma Mon Luk in Quiapo is sorely lacking in ambience. People who have not been introduced to its offerings would probably grimace at the drab surroundings. Plus, it doesn't help that it's located in Quiapo and there isn't any parking space available for its patrons. But despite this, one will still see a lot of nice cars trying to squeeze into parking spaces in adjoining busy streets. Around meal times, the place still gets packed. And where take-outs are concerned, the place does make a killing. Sometimes, they even run out of siopao as early as 5 PM. Ma Mon Luk is actually not for the poor. A regular siopao costs P40 (special costs P55, I think) already and a regular order of chicken mami costs P85 (special is P95, beef is P100). 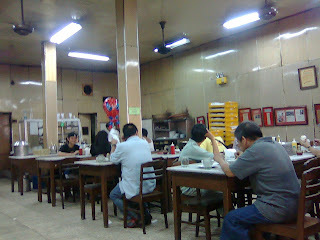 And though they have other offerings (such as short order noodles and dimsums), these two are really their bestsellers. And seriously, I have yet to taste a yummier siopao! I actually don't know why their mami costs so much, but it is very delicious as well (but the siopao is the incomparable one). So if you want to eat something authentic Fil-Chi, or give your expat/foreigner friends a treat, try Ma Mon Luk. If you're scared of Quiapo, try their QC branch. THE CIRCA WAS 60'S, I AM A JUNIOR SOPHOMORE WHEN I HAVE MY FIRST DATE AFTER SEEING A MOVIE AT CENTER THEATRE AND WE WENT TO MAMONLUK TO ORDER A BIG BOWL OF BEEF MAMI AND A SPECIAL SIOPAO WITH SALTED EGG AND MEAT BALL INSIDE WHICH WE SHARED.THIS IS THE FIRST TIME TO EAT AT MAMONLUK . A SLIM CHINESE COOK WEARING ONLY SANDO WAS LOOKING AT US INSIDE THE KITCHEN BITING A TOOTHPICK IN HIS MOUTH. I WAVE MY HAND AS A SIGN OF GREETINGS AND HE SMILE, AFTER A FEW MINUTES, A WAITER COME TO OUR TABLE AND HANDED ME A SMALL BROWN PAPER BAG (SUPOT) CONTAINING 2 PCS. OF SIOMAI GIVEN FREE BY THE SLIM CHINESE COOK.FROM THEREON, I DON'T FORGET TO GREET THIS MR. SLIM CHINESE COOK BUT WE DIDN'T HAVE TIME TO TALKED TO BECAUSE HE WAS ALWAYS BUSY. LATELY, IN THE MIDDLE PART OF 1990'S, WHEN I VISITED AGAIN MAMONLUK IN QUIAPO, I ASKED THE WAITER, WHERE IS THE SLIM CHINESE MAN AND REPLIED THAT HE IS ONLY 4 MONTHS IN MAMONLUK AND HE DIDN'T KNOW THE MAN. HOWEVER, THE TASTE OF SIOMAI AND MANI IS STILL THE SAME THE FIRST TIME TO VISIT THE PLACE UP TO MY LAST VISIT THIS FIRST WEEK OF JANUARY 2010. THE TASTE REMAINS THE SAME AS IF NEIL YOUNG COMPOSE THE SONG REMAINS THE SAME.